This is Pre-Order. The product will be shipped by reservation order. We will email you after placing each order. Thank you for your understanding this start up condition. This is custom Front Bumper and Rip Spoiler Parts. 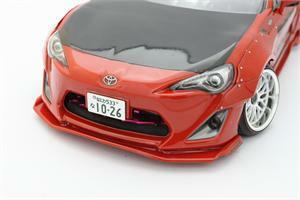 It fits for TAMIYA TOYOTA 86 body. The following Unpainted Lexan parts are included in this product. The main body part is not included in this product. The picture is painted as a sample. Stickers, Wheels, Tires, LED Lights, Rear view mirrors and the muffler of the sample picture are not included. Because this product will be shipped out from Japan, it takes the time of approximately 3 or 4 weeks by arrival. Also shipping method of this product is regular mail from Japan Post Office without track information. We can not guarantee delivery date and insurance. If you want to ship EMS with track information, Please choose "Priority mail express" from shipping method.